Overview and code samples for the $expand, $select, and $value options in OData Web API 2 for ASP.NET 4.x. These options allow a client to control the representation that it gets back from the server. $expand causes related entities to be included inline in the response. $select selects a subset of properties to include in the response. $value gets the raw value of a property. 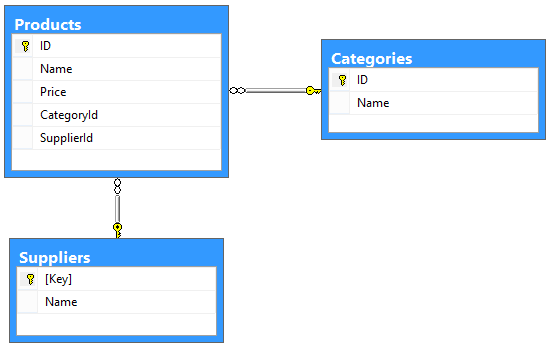 For this article, I'll use an OData service that defines three entities: Product, Supplier, and Category. Each product has one category and one supplier. Notice that the Product class defines navigation properties for the Supplier and Category. The Category class defines a navigation property for the products in each category. To create an OData endpoint for this schema, use the Visual Studio 2013 scaffolding, as described in Creating an OData Endpoint in ASP.NET Web API. Add separate controllers for Product, Category, and Supplier. In Visual Studio 2013, the Web API OData scaffolding creates a controller that automatically supports $expand and $select. For reference, here are the requirements to support $expand and $select in a controller. For collections, the controller's Get method must return an IQueryable. For single entities, return a SingleResult<T>, where T is an IQueryable that contains zero or one entities. Notice that each entry in the "value" array contains a Products list. The $expand option takes a comma-separated list of navigation properties to expand. The following request expands both the category and the supplier for a product. You can expand more than one level of navigation property. The following example includes all the products for a category and also the supplier for each product. By default, Web API limits the maximum expansion depth to 2. That prevents the client from sending complex requests like $expand=Orders/OrderDetails/Product/Supplier/Region, which might be inefficient to query and create large responses. To override the default, set the MaxExpansionDepth property on the [Queryable] attribute. For more information about the $expand option, see Expand System Query Option ($expand) in the official OData documentation. You can combine $select and $expand in the same query. Make sure to include the expanded property in the $select option. For example, the following request gets the product name and supplier. You can also select the properties within an expanded property. The following request expands Products and selects category name plus product name. For more information about the $select option, see Select System Query Option ($select) in the official OData documentation. There are two ways for an OData client to get an individual property from an entity. The client can either get the value in OData format, or get the raw value of the property. The following request gets a property in OData format. Here is the response. Notice that the content type is "text/plain", not JSON.